Breslau Art Glass, owned and operated by David and Beth Wood, has served the Kitchener-Waterloo area for over 30 years. 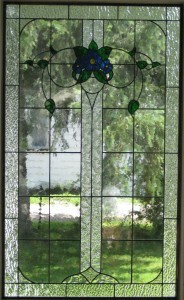 People from all over the Kitchener-Waterloo area and Southern Ontario have trusted Breslau Art Glass to supply them with expert custom workmanship in stained glass windows, the best class instruction, stained glass, tools, patterns, advice and stained glass supplies. Located between Kitchener-Waterloo, Cambridge,and Guelph, Breslau Art Glass offers everything you need whether you’re a professional stained glass artisan, a beginning hobbyist or someone looking for that perfect custom Stained glass window. Master craftsmen David Wood and Peter Galway will build that special window, or glass cabinet door panel for you. Visit our studio/ showroom /store for all your stained glass needs. We will be pleased to serve you.